In October, I was riding to work on the first day of the Bart strike. The F Transbay bus had no room on the front rack, so I took the Caltrans bike shuttle instead. I used to do this every day, typically sharing the van with fourteen other riders. Many of them tend to be messengers and other working cyclists, and I was out of practice. Someone scolded me for putting my bike into the wrong spot on the trailer, and my already off-kilter morning was thrown further out of balance. The bike shuttle no longer stopped at the Transbay terminal, and instead let us off at the foot of Harrison. I rode east, through a city confused by extra traffic and new patterns. Hours later, I heard how the whole city seemed to be more on-edge than usual, stress building up in the face of Bart riders forced to find other means of getting around. As I crossed 7th Street, I was struck from the left by a taxicab and thrown 20 feet to the ground. 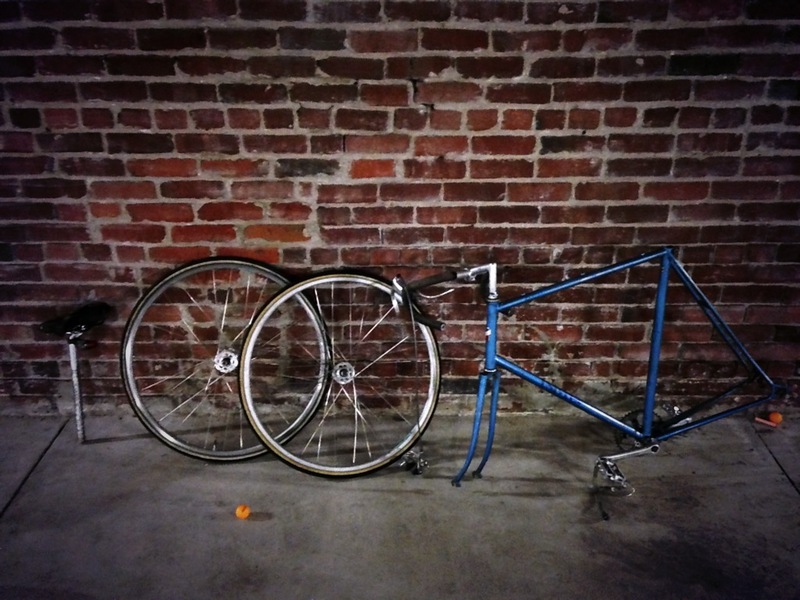 I was taken to the emergency room at SF General, while the police took the bike to my office. It spent the next several months in the basement of Code for America as my back and shoulder healed so I could ride again. The Univega was a true trash treasure, and I wanted to salvage the parts I had added to it over time. The frame was a total loss. The wheels were twisted out of shape, though the hubs were fine. The handlebars could be bent back, the stem was fine, the seat survived, the brake looked good, and I had some hope for the cranks. 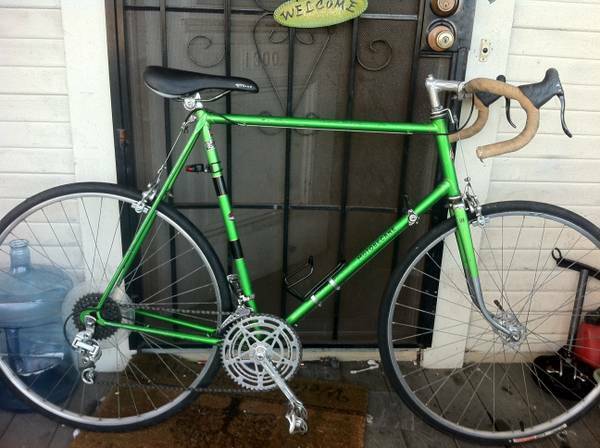 I’d never worked on a French bike before, and wasn’t sure entirely what to expect. It looked like any other steel bike boom frame, but when I got to work and stripped it down to the frame, I found a few important differences. The brake hole on this frame wasn’t wide enough for a recessed mounting, typical of newer bikes and my existing brake. I looked at buying some nutted-mount caliper brakes, and briefly considered drilling out the back of the fork crown to make room for the wider bolt. I gave up on using the caliper front brake from the Univega and instead cleaned up the center-pull brakes that came with the Motobecane. I got most of the gunk off and put them back on as I had received them, but found that the adjustment of a center-pull brake is a serious pain. There’s a tool called a “third hand” you can use to make this easier; I didn’t get one. The dimensions of the spindle holding the cranks turned out to be important. My older cranks were made for a longer spindle, and when I first assembled everything and tightened the cranks on, they would not turn. Oops. I pulled apart the bottom bracket from the Univega to see if I could salvage parts, but they weren’t transferrable to the new bike. I did a bit of research on bottom brackets, and learned that French frames are different from other frames. The difference is not always apparent by sight. I ended up buying a complete, sealed, French-threaded bottom bracket from Velo Orange, along with the tool to install it. Finally, when I added my old cranks to the new frame I realized that they were slightly bent from the accident. It wasn’t visually obvious, but felt completely wrong when riding. So, I had to buy a new set of Sakae cranks with a neat-looking tornado shape. Cool, but the overall costs really added up. 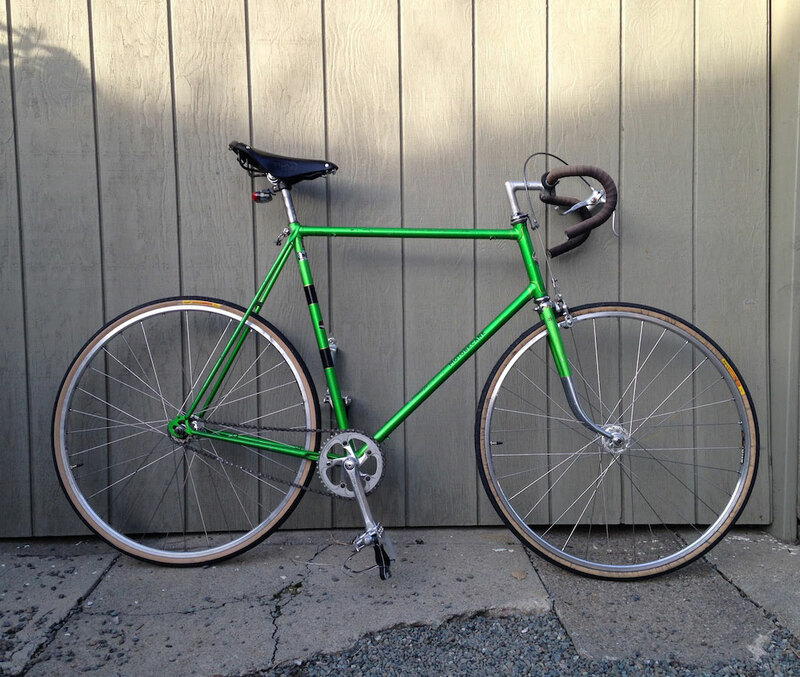 One of the fun initial steps of building this bike was the chance to make wheels from parts. My friend Adam is a bicycle mechanic, and taught me how to build traditional spoked wheels on a truing stand. I’d never done this before, but with his direction even the one that I mostly built turned out great. Actually, I couldn’t have done half this stuff without regularly asking Adam for help. From him I learned that 1.375” looks a lot like 35mm, 24 threads-per-inch looks a lot like 1mm spacing, stems come in 22mm and 22.2mm diameters, and slightly-bent cranks go in the recycling with the beer bottles.